Winner of the Grolsch People’s Choice Award at the 2018 Toronto Film Festival and an official Selection of the 2018 Telluride Film Festival. In the US, Free Solo achieved the highest 2018 opening weekend per screen average for a documentary. “Alex Honnold’s Free Solo climb should be celebrated as one of the great athletic feats of any kind, ever.” The New York Times “One of the most arresting documentaries of the year. See the film on as big a screen as possible.” Richard Lawson, Vanity Fair “Riveting…absorbing…and fresh. It rocks.” David Ehrlich, IndieWire “Brilliantly photographed by Jimmy Chin, Clair Popkin and Mikey Schaefer.” Keith Uhlich, The Hollywood Reporter “A superhero whose superpower is near fearlessness.” Richard Lawson, Vanity Fair. 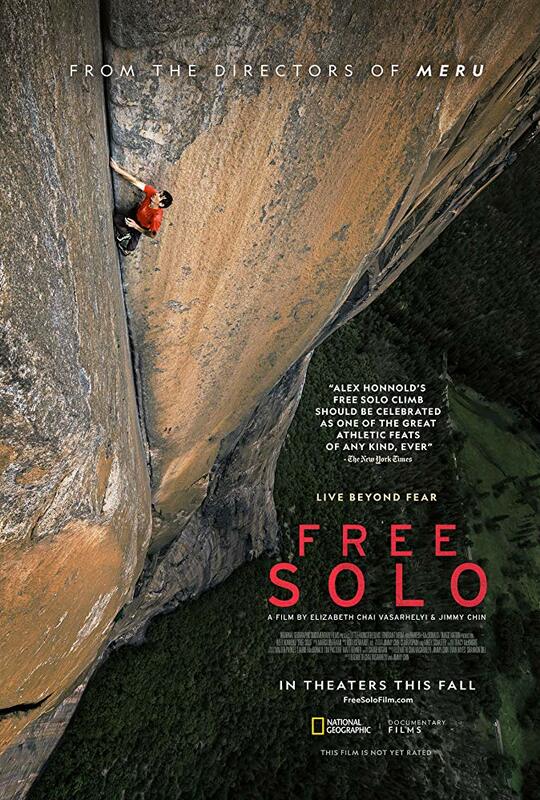 (LONDON – xxxx, 2018) ​- Following last year’s UK release of the BAFTA nominated film JANE, National Geographic Documentary Films announced today the theatrical release of a new feature documentary, FREE SOLO. The vertigo-inducing film from award-winning filmmaker E. Chai Vasarhelyi and world-renowned photographer and mountaineer Jimmy Chin, the directors of “MERU,” FREE SOLO debuted at the Telluride Film Festival and won the audience choice award at the Toronto Film Festival. In the US, FREE SOLO achieved the highest per-theatre average debuting to $300,804 on four screens, translating to $75,201 per location. FREE SOLO (14 December) will be distributed by Dogwoof, in select cinemas across the UK. FREE SOLO is a stunning, intimate and unflinching portrait of free soloist climber Alex Honnold, as he prepares to achieve his lifelong dream: climbing the face of the world’s most famous rock … the 3,200-foot El Capitan in Yosemite National Park … without a rope. Celebrated as one of the greatest athletic feats of any kind, Honnold’s climb set the ultimate standard: perfection or death. Succeeding in this challenge places his story in the annals of human achievement. National Geographic Documentary Films is committed to bringing the world premium, feature documentaries that cover timely, provocative and globally relevant stories from the very best documentary filmmakers in the world.